Healthcare providers determine the extent of upper extremity injuries by palpating the area, assessing range of motion, performing x-rays or other types of scans, and employing other diagnostic tests. After a diagnosis is made, treatment can include tactics such as surgery, pain medication, physical therapy, cold compression therapy, or a combination of these. Returning to normal activity as quickly as possible is always a goal for both the patient and physician, especially in the case of upper extremity injury. Some of the most common injuries to the upper extremities are outlined below. Risk factors such as participation in sports or conditions such as osteoporosis or other bone disease increase the chances of sustaining a hand or wrist fracture. A sudden loss of range of motion is common with a hand or wrist fracture, but this is not always the case. Any suspected fracture should be treated immediately. If left untreated, even a small fracture can affect the alignment of the entire hand. The stretching or tearing of ligaments causes a sprain, while the stretching or tearing of muscles or tendons is classified as a strain. Both types of injuries can be caused in any of the same ways as a hand or wrist fracture, but an acute hand or wrist sprain is more common than an acute strain. On the other hand, chronic wrist strain can occur in gymnasts, rowers, golfers, and tennis players due to the prolonged, repetitive movements required in these sports. The symptoms of sprains are also similar to those of a fracture, which is why getting a diagnosis from a medical professional is so important. After spraining a hand or wrist, you might experience pain, swelling, limited range of motion, and bruising in the affected area. If a sprain is suspected, your doctor might still perform x-rays to confirm that none of the bones are fractured. After a fracture has been ruled out, an MRI scan can show the extent of the injury to the soft tissues. 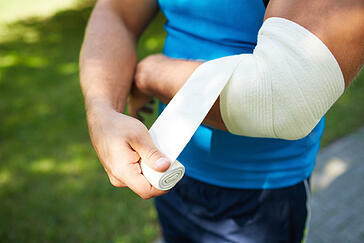 Even if it seems like it might be just a minor injury, any potential sprain of the hand or wrist should be treated. In some cases, a suspected sprain might actually be a fracture. Regardless of the reason for the pain, it can become quite a nuisance if left untreated. Depending on the diagnosis, a doctor might recommend pain medication, heat and cold therapy, or physical therapy. Occupational injuries can occur when an individual does a repetitive motion with their upper extremities. This can happen in environments such as certain sports, professional offices, food preparation, manufacturing, or factory assembly lines. Additional factors such as pinched nerves and fatigued muscles and tendons can lead to reoccurring acute injuries that can be quite painful. Some of the common symptoms that occur with this type of injury include numbness and tingling in the hands, pain radiating from the wrist, or a feeling of weakness in the hands. If these types of symptoms are not effectively treated they can worsen and contribute to further muscle and tissue damage. The treatment for these types of injuries varies but it can include any combination of these four approaches: wrist wraps, bandages with ice packs, physical therapy, and cold compression therapy.